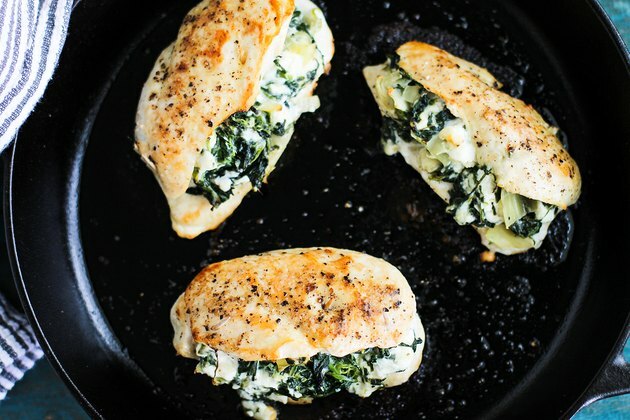 This recipe for spinach and artichoke stuffed chicken is perfect to satisfy your craving any night of the week. 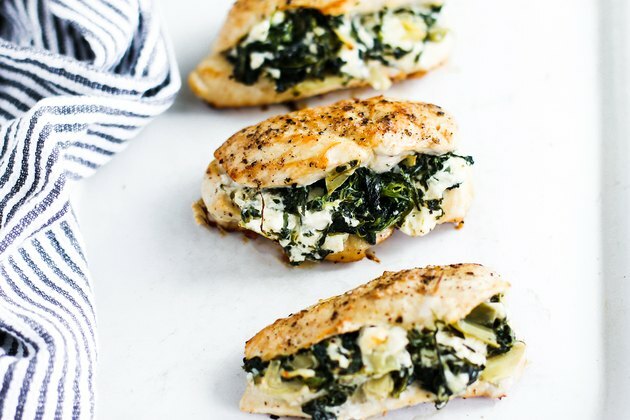 Spinach, artichokes, a mixture of cheeses and garlic come together to create the most flavorful filling that will get you out of your chicken rut. I love it because it's a veggie and protein in one dish–can't get much easier than that! 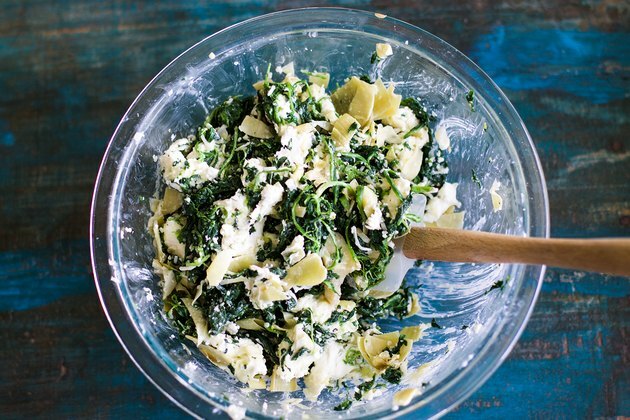 Combine spinach, artichokes, cream cheese, mozzarella, parmesan, garlic and half of the salt and pepper in a bowl. Using a spoon or your hands, combine until cream cheese has been mixed thoroughly throughout. For frozen spinach, make sure to thoroughly remove all of the liquid. Defrost it and then, using a paper towel or dish towel, place spinach inside the towel and squeeze all of the liquid out of the spinach. 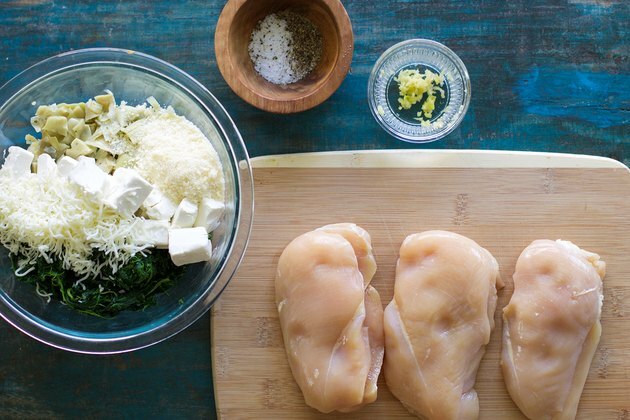 Make a slit in each chicken breast down the middle. Be careful not to cut all the way through. Take about 1/4 cup of filling and stuff inside chicken breasts, then secure with a toothpick. Season the top of the breasts with salt and pepper. Heat an oven proof skillet to medium high heat. Add oil, and then add chicken breasts, seasoned side down, and sear for 5 minutes. Season the second side with salt and pepper at this time. Flip the chicken breasts and then place into preheated oven. If you don't have an oven proof skillet, simply sear in a pan and then transfer to a baking sheet before putting in the oven to bake! 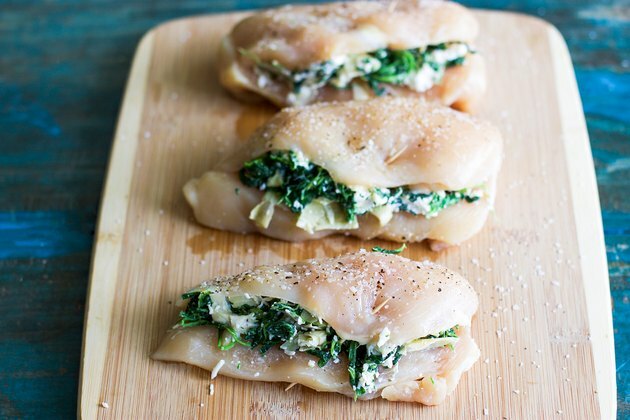 Bake the stuffed chicken breasts for 15-17 minutes until cooked through. Serve immediately. 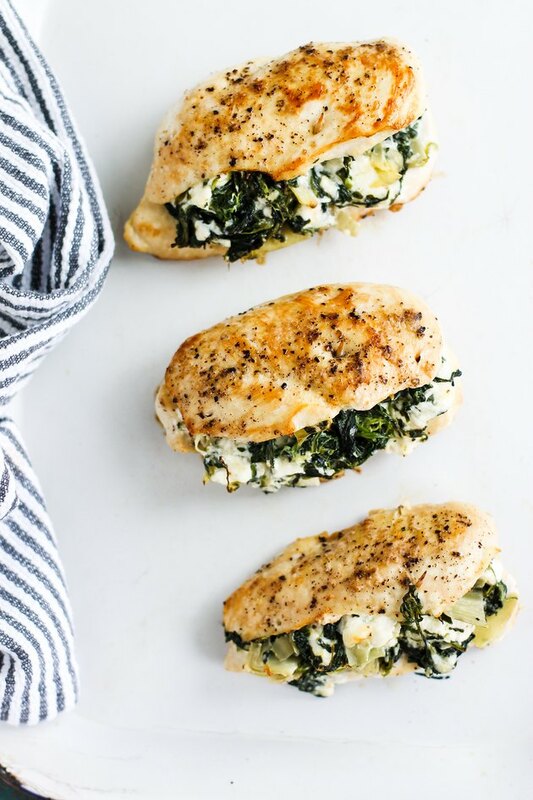 Just like that you will have delicious spinach and artichoke stuffed chicken that will have everyone at your table smiling. Give this recipe a try–you won't regret it!